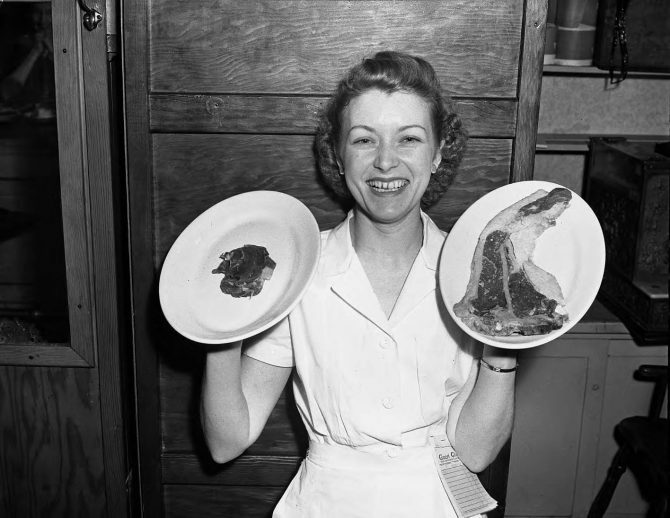 Waitress Ann Moffitt holds up two plates, one with a large T-bone steak (right) and a second with a cut of meat that meets the new federal rationing rules that went into effect in March of 1943. By decree from the Office of Price Administration, supplies of meat to hotels and restaurants were reduced 25 to 45%. Government experts calculated that under the new order the average amount of meat served to a customer would be 3 ounces.